"Have you seen a talking tree?” I was standing by the placid Brisbane River in the world’s 16 th most livable city when Greg Floyd, the guide, threw in a question. Talking tree? I know of irate rivers, echoing mountains and whistling wind, but had never heard of a talking tree. Did raucous ghouls live there? Or, were mischievous pixies having a loud conversation? Where I stood was a large fig tree and Newstead House, Brisbane’s oldest surviving residence. “Here is the talking tree,” Flyod walked a few steps, twirled his hand in front of a large fig tree and lo! the tree started talking. “I am the fig tree and the house that you see at the edge was built in 1846 for pastoralist Patrick Leslie…” In its guttural voice, the tree was narrating the story of Australia ’s third most populous city, a city that began life as a penal settlement and is now classified as Beta – World City. Thus, began my tryst with Brisbane . The city resplendent in the summer sun seemed to have forgotten the recent wrath of an angry river and the agony of massive floods. And I decided to hop into a gondola. No, not a gondola on River Brisbane but a gondola hanging 60 metres above the ground. I booked a seat in the Wheel of Brisbane for a high-up 360-degree view of the city that in 1831 had a population peak at 1000 convicts and 175 soldiers! As the Wheel turned and my stomach churned, the narrative began. 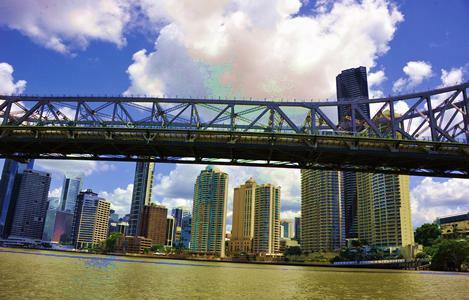 Brisbane ’s skyline was sitting smug by River Brisbane which was discovered serendipitously in 1823 by four ticket-of-leave convicts who were blown north by a storm. The castaways were the first known Europeans to have reached the river that flows 344 kms from Mount Stanley . For the next few minutes, the Wheel turned around gently for magnificent views of Goodwill Bridge , the GABBA, Commissariat Store Building , Botanical Gardens and Mount Coo-Tha , Brisbane ’s highest peak. From the sky I landed on the river with a hoot. Literally. Having seen the city from up in the sky, I chose to do a sea-see. And what better way than the River City Cruise boat that meanders gently on the river. Before I could gape at the Ella’s Pink Lady yacht on which 16-year old Jessica Watson circumnavigated the world in 210 days, the dainty scones on the table that had me tempted. Inside the immaculate ship lay a plateful of scones with berry jam and cream as perfect accompaniments. The boat meandered through city’s landmark like Victoria Bridge, Tramway Powerhouse, a century-old sugar refinery, fish markets at South Bank and the impressive Story Bridge, I filled up on scones. For another silken coast waited. Barely 43 miles away lay a coast of gold. Gold as a metaphor, stupid! I was in Gold Coast. The surfer’s paradise. Not a gold digger’s haunt. The facts mocked. After Jim Cavill built the Surfer’s Paradise Hotel in 1925, tourists started pouring into this tail end of Queensland and in the 1940s journalists and speculators started calling it the Gold Coast. Well, they must have been really repetitive for in 1958, the Town Council officially christened it as Gold Coast. In the Gold Coast, you can never pack the entire to-do list in one holiday. You need a lifetime. The least you can do is rent an apartment by the sea and live adventurously ever after. If you have a million-dollar yacht you could anchor it in the Marina Mirage and while you sip your champagne a bell boy could scrub its sides clean. If your heart twitched to conquer the waves, you can hire a Speedo and a surfboard and even take quick lessons in surfing. You can dive, go on a hot air balloon, paraglide, jet ski, shop or swing the night away in the pubs. Or if you want to get beamed up Q1, the world’s largest residential building, buy a ticket, hold your heart and walk into the elevator that would take you up 77 floors in 42.79 seconds. As I looked down from the world’s 20th tallest building, the entire Gold Coast resembled a mop of skyscrapers, hundreds of them raising their concrete grey heads encroaching on the blue of the dazzling sky. Far away I could see a fleck of gold. Maybe it was the golden bikini of the meter maid or her sparkling tiara. I would walk down, chase that speck and tell golden stories about Gold Coast.